Kerascoët’s and Fabien Vehlmann’s unsettling and gorgeous anti-fairy tale is a searing condemnation of our vast capacity for evil writ tiny. Join princess Aurora and her friends as they journey to civilization's heart of darkness in a bleak allegory about surviving the human experience. The sweet faces and bright leaves of Kerascoët’s delicate watercolors serve to highlight the evil that dwells beneath Vehlmann's story as pettiness, greed, and jealousy take over. 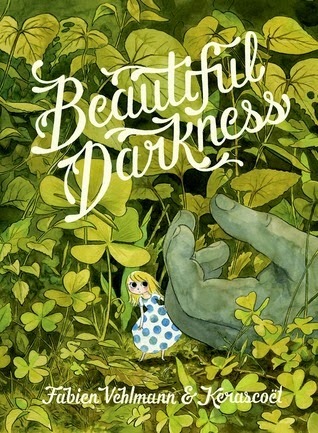 Beautiful Darkness is a harrowing look behind the routine politeness and meaningless kindness of civilized society. It doesn't get much darker than this story of a group of tiny people who live inside the corpse of a dead little girl. Until, that is, her corpse starts to decompose and they are forced into the woods where they are threatened by evils both internal and external. It's horrifying enough when you consider it a grim fairy tale full of butchery and danger, but when you realize that it's a metaphor for the bleakness of life as a human and all its trials and tribulations, you'll just want to lay right down and die. Except you won't because the art is so beautiful that it completely outweighs the horror of what you're seeing happen to these adorable tiny people. Which, I suppose, is its own metaphor for the human experience. Shockingly brutal, but also beautiful beyond words. It demands to be reread once you get what the author is trying to convey and it's totally worth that reread. It's certainly not a book that I'd recommend across the board to everyone, even everyone interested in comics. It's not for children and it's also not for those who will be appalled at the idea of a precious little race of tiny people being slaughtered by nature and by each other. Have I mentioned that this is dark? However, if you can stomach it, I think it's not only a pretty deep and interesting commentary on what it means to be human in our world, but it's also gorgeously illustrated. I don't frequently reread, even graphic novels, so it's high praise that this one demanded a more thorough second read. It's just beautifully done, on both a metaphoric and artistic level and I highly recommend trying it.